Adrenal Fatigue is one of those misunderstood sets of symptoms that is denied by the mainstream medical system. Although definitive laboratory tests actually do exist for it, many physicians wait until the adrenal glands are in complete failure before treating a patient who is suffering from it. And “suffering” is the perfect word for it. How do I know this? Because I’ve been fighting this debilitating condition for the past three years. Adrenal Fatigue is more formally known as HPA Axis Dysfunction. The HPA axis is the relationship between the hypothalamus, the pituitary gland, and the adrenal glands. Pituitary Gland: This tiny gland receives signals from the hypothalamus and produces essential hormones like growth hormone and luteinizing hormone. But when these things don’t communicate correctly, that’s when you can run into Adrenal Fatigue. We begin with the stressor. That could be a moment of imminent physical danger, or it could be simply thinking about a public speaking engagement next week. Whichever it is, the reaction from your body is pretty much the same. Next, your hypothalamus releases corticotrophin-releasing hormone, which sends a message to the pituitary. This stimulates the pituitary’s ACTH production, which then prompts your adrenals to make cortisol. Among other things, cortisol raises the sugar in your bloodstream and prepares your body for the high-energy ‘fight-or-flight’ response that it is anticipating. Your adrenals also release adrenaline, which raises your heart rate and increases your blood pressure. These interactions continue until your hormones reach the levels that your body needs, and then a series of chemical reactions begins to switch them off. For example the cortisol released by the adrenals actually inhibits the hypothalamus and pituitary (so they stop sending signals to produce more cortisol!). This is just one of the automatic switches that we call negative feedback loops, and these loops are one reason why the HPA axis is so extraordinary. So what happens when you have severe adrenal fatigue? Well, those signals might still get sent from the hypothalamus to the pituitary gland, and from the pituitary gland to the adrenal glands. But when the message reaches your adrenals, nothing happens. The adrenal glands have become so depleted that they are unable to release or produce the hormones that you need to react to a stressful situation. With all of the different hormones involved in this, as you can imagine, there are a vast number of symptoms. But the primary symptom is debilitating exhaustion. It is an exhaustion so profound that a trip to the bathroom can feel like a marathon through the Sahara. It is an exhaustion that is unrelieved by sleep or rest. It is an exhaustion that, if you “push through it,” lands you in bed for a week after over-exerting yourself. If you have been pregnant, you may recall the extreme fatigue you felt during certain parts of your pregnancy that forced you to rest because you just couldn’t keep going. Your body just said, “No more” so you rested and then you felt better. Now, imagine feeling that extreme fatigue relentlessly for years. In short, it’s completely debilitating and life-altering. According to many experts, long-term stress, even if it is low-level, can cause adrenal fatigue to begin. People who tend to keep their stress all inside and power through can be more likely to suffer from adrenal fatigue than those who let it out more. 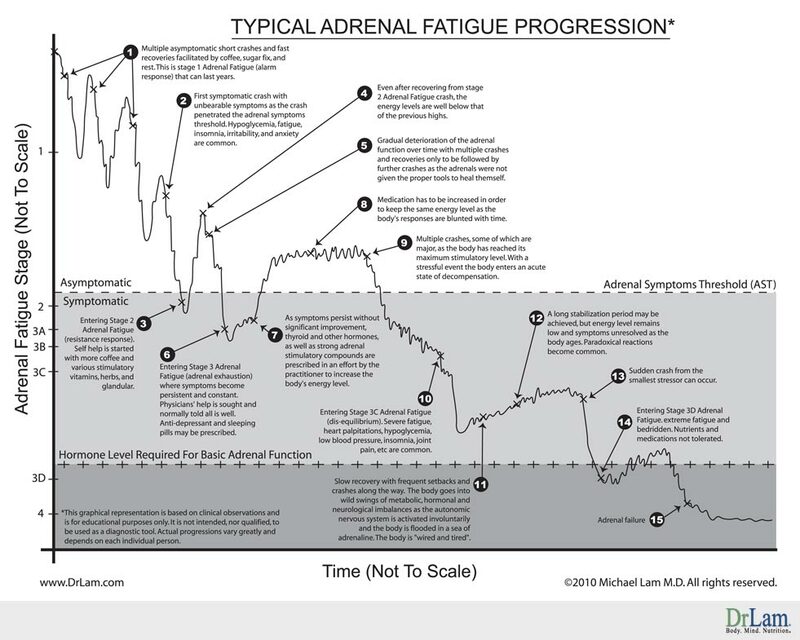 For someone with adrenal fatigue, this is a constant state over a long period of time, however. It wreaks havoc on the body because those functions that are non-essential in a brief emergency are very essential over a period of time. There are 4 stages to Adrenal Fatigue, as it is a progressive condition. This infographic comes from the very informative website of Dr. Michael Lam, a physician who specializes in AF. This article breaks down the stages in great detail. The more advanced your progression, the longer it can take to fully recover. How do you get treatment for Adrenal Fatigue? There is a medical test for Adrenal Fatigue called a salivary cortisol test. Most Adrenal Fatigue experts agree that no other method of testing is considered accurate. You can request this from your doctor, or, if your doctor is one who disregards Adrenal Fatigue, you can order it yourself right here. Saliva samples are taken at 4 specific times throughout the day to measure your cortisol levels. Cortisol should peak in the morning then taper off toward the evening. The results of this test are fairly easy to understand, but a holistic physician can help you create a treatment plan should you discover that you have an issue with your cortisol levels. It’s important to note that you must know if your cortisol levels are too low or too high in order to determine treatment. In earlier stages of the condition, cortisol is far too high, which is what is causing insomnia and other symptoms. Later on, your body isn’t producing enough cortisol to maintain your energy. There isn’t a one-size-fits-all treatment. You could require a solution that calms the production of cortisol or one that replaces the cortisol that is missing. Don’t just start taking supplements that are labeled “adrenal health” – you may be treating the wrong end of the illness and if so, you’ll make yourself worse. As well, don’t just guess. 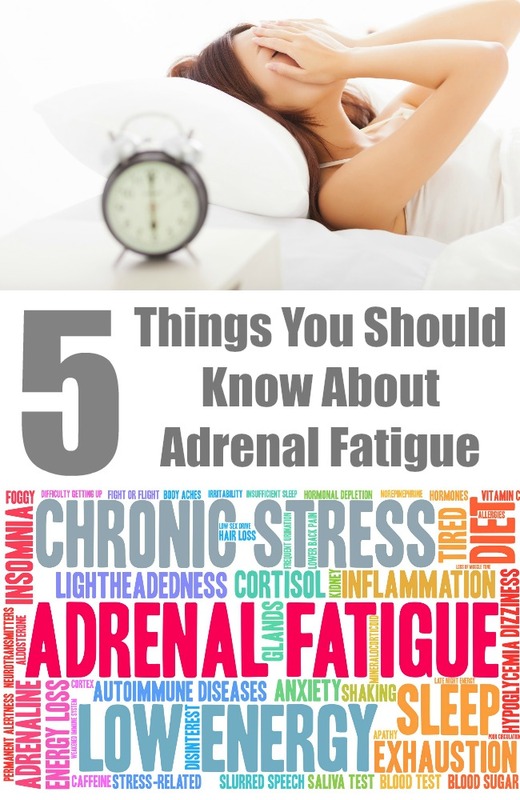 You may have adrenal fatigue but you may also have another serious condition. You should have a full physical with a trusted doctor to rule out other causes for your symptoms. There is a lot of advice on the internet that is extremely unreliable. When I was searching for answers myself, I found so many conflicting treatments that I had no idea which way to turn. Luckily, the MD that was our doctor in California had holistic leanings, as does our MD here in Virginia. They prescribed both traditional medications and natural supplements to help manage the condition. However, the real healing began when I started working with a Registered Holistic Nutritionist. Not everyone is so lucky with their medical care, unfortunately. Can your doctor diagnose Adrenal Fatigue? Sadly, you may not be able to expect much from a conventional physician. Often, a sufferer will be treated for a mental illness, like depression or anxiety, while the underlying cause is ignored. Testable symptoms, like hypothyroid or hypoglycemia, may also be treated, but again, until the underlying cause is addressed, a full recovery won’t happen. Many doctors dismiss Adrenal Fatigue as something that doesn’t exist. They deny the existence of the malfunction until it reaches the stage of nearly complete adrenal failure, Addison’s Disease. This is a life-threatening condition that requires hormone supplementation for the rest of your life. Perhaps that is because simply throwing medication at the problem doesn’t work. It is a complex issue that can take years for recovery. This article from Fox News and this one from the Washington Post are perfect examples of the medical system that denies Adrenal Fatigue exists. Just for a quick comparison, it was only this year that the medical community finally admitted that Chronic Lyme Disease exists and that former treatment protocols were completely inadequate. And last year, Chronic Fatigue Syndrome finally gained recognition by the medical community. Sufferers of fibromyalgia dealt with the same denial for many years. Perhaps it’s merely a coincidence that these mysterious conditions don’t really get recognized until there is money in it for Big Pharma. Here’s my own adrenal fatigue story. It was not an easy one to write because this has been absolutely brutal, but I wanted to share with you how I began to heal from this condition. Maybe my journey will help you find your own answers. PreviousShould antidepressants be given prophylactically to nondepressed Individuals?